Synthetic grass requires much less maintenance than fresh grass, but it still requires some upkeep and inspecting as the summer wears on. In order to keep your grass looking its best, you’ll want to check the following things and make adjustments accordingly. Debris will affect your ability to play on your field, as it will block parts of the shock absorption layer from performing fully. The off-season is the perfect time to give your grass a thorough cleaning to remove leaves and twigs that could be caught between the blades. Cleaning the grass will also remove any lingering odors left over from sweat and animal dander, providing a disinfected area for your athletes to begin practicing or your children to run and play in the yard. If your grass blades are maintaining their color but beginning to look flat, you may need to replace and re-allocate some of your rubber infill so it is evenly distributed across the field. If your infill has just shifted, you can move it around by raking the grass. If you can visibly see the seams from the sheets of turf, you will need to schedule a maintenance appointment with your synthetic grass company. This can be caused by high foot traffic volume over the years, and a professional will be able to determine the best course to restore your field. If you are interested in having your grass inspected by a professional this summer, contact Turf Prep today. 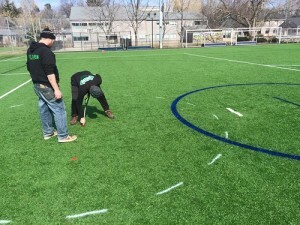 During our maintenance visit we will be able to check your infill levels, touch up paint and perform safety testing on your grass to keep it in top condition. To schedule an appointment, Turf Prep can be reached by calling 1-877-774-8873 or by filling out our online form.